Days are going fast when you are in tropical paradise – swimming in the ocean, snorkeling, walking on the beach, drinking margaritas and beer in a shade by the pool… We knew we should do something else if we wanted to see more of the area. We called Tony “The Taxi Man” and set the price for the trip: spending a day on archeological site La Soledad de Maciel. 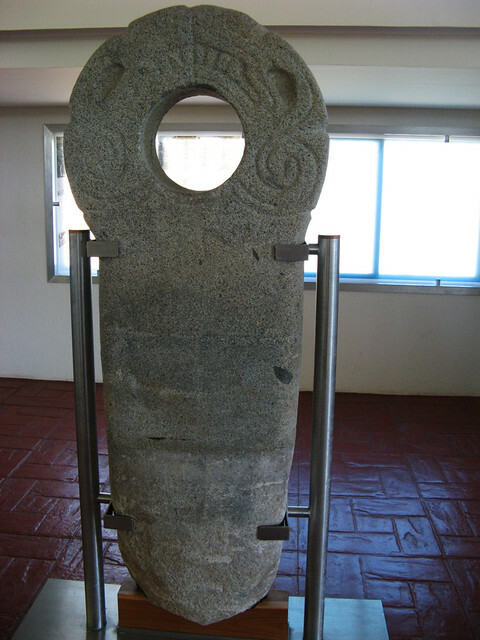 The site is situated about 30km south of Ixtapa, near the Highway 200, toward Acapulco. A trip was also a possibility to see part of, as I called it, a real Mexico, something you can’t really see if you indulge yourself in tourist resort. But the hint of it is not anywhere close to the reality – poverty, bad roads, people driving on a back of the truck or on motorcycles without any protective gear; police patrols with machine guns; garbage and rusty old cars, just pushed by the side of the road; plantations of coconut trees; poisonous insects. Driving during a day is mostly recommended (Guerrero and Michoacan are “famous” for drug cartel wars; this happened just recently) and having someone local is always a plus. Tony was living in Alberta, Canada for few years and knows English good enough to talk with us and translate – something we didn’t think we will need in a museum, but that proved to be priceless. A guide at the site spoke only Spanish and without Tony we would lose a lot of interesting information. La Soledad de Maciel is a village of population of about 400 and its inhabitants grow corn, beans, vegetables and coconuts. 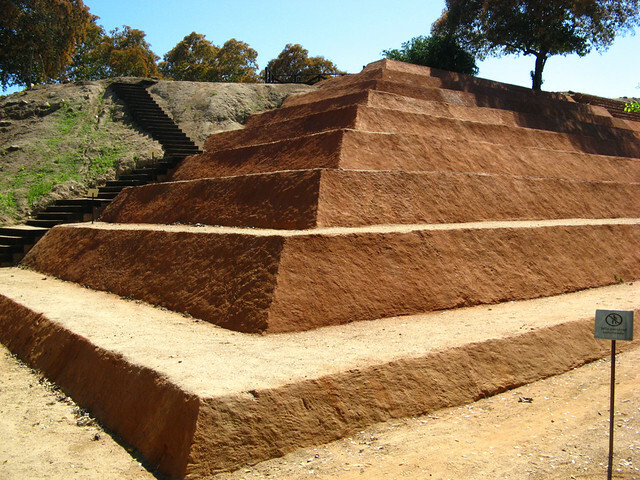 In the area, known as Xihuacan which is Nahuatl word meaning “place of the holders of Turquoise” and refers to a metaphor to refer to those “who have the time” or “that control the calendar”, some of the most important Cuitlatec ruins were found and excavations started at the end of 2000. One of the biggest Mesoamerican ball game court was found, as well as some of the pyramids. Cuitlatecs were having trade relations with other and more famous civilizations and ethnic groups in pre-Columbian era, from Olmecs and Mayas to Toltecs and Aztecs, therefore adopting many customs. One of them was ball game which seemed to be very popular back then. I’ve found a lot of links to Mesoamerican ball game and all of them agreed in one: winner(s) were local stars and losers ended up as slaves but mostly were just sacrificed. Now, what a guide told us, among Cutlatecs, games would end slightly different. Winner would end up with his throat and chest cut and heart taken out; his blood was collected and placed in the middle of the court so sun at the noon would purify it; then it was used to spread on crop fields to increase the yield. In return, his family would be fed and children educated so sacrifice was considered an honour. Now, I just hope that was not a misunderstanding and translation error; on our repeated question, guide confirmed that a winner was executed. A mind twisting fact, eh? The rules of the game are not known and there were probably some differences among nations but one thing was the same for all of them: the main aim was to put a solid rubber ball through the stone ring. But it was not that easy because players were not supposed to use their hands. Elbows, thighs, knees and shoulders. But not hands. Tricky. The other object excavated was a pyramid. Not that impressive as some that Mayans made but anyway. They were made of adobe which was unique at the time. Unfortunately, that mixture of sand, clay and straw was not made to last. A big tsunami (that happened sometime after 10th century) covered the buildings with sand and dirt; after the excavations started, some parts of the pyramid were needed to be reconstructed. Rising Aztecs were putting pressure onto the Cuitlateco dominion during 15th century and eventually they ceased to exist. Their language and ethnic identity disappeared and now they are considered extinct. Wavy hills around us are hiding more pyramids and buildings but some other games are popular these days. Mayans and Aztecs had some fascinating culture and rituals – fascinating and terrifying. That goal post type thing I have seen used in Battlestar Galactica, something like this goal anyway. It’s probably based on this one. Were you nervous, going through the non touristy, more dangerous parts of Mexico? Hold on, you’re three thousand one hundred and seven feet tall! Did they not think you were one of the sun gods come to judge them? Was there a spate of human sacrifices that started when you arrived? I always loved the idea that these people had a civilisation built around performing well at a sport so they could be sacrificed. It always amazed me trying to get into the head of someone in that situation. On the one hand they’re treated like royalty up until that point and their family are well fed for a whole year following it, but how many people would that be enough for? There had to be people who faked injury and threw the game. 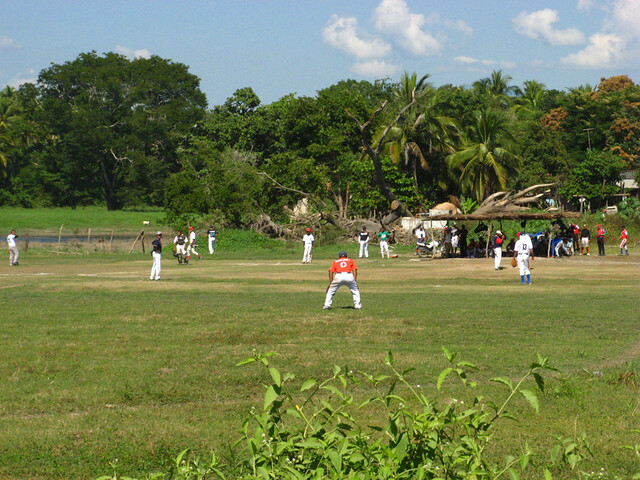 Ballgame was having religious purpose in some areas – in La Soledad de Maciel, for instance – but some other cultures were playing it for fun, like Aztecs. See, I’m all for the ritual sacrifice thing. That makes sense. But doing it for fun leads to doing it while drunk to enhance the fun, which leads eventually to people spoiling for a fight because someone isn’t wearing the right colours on the right day. I’m with the religious guys on this one. There is a children’s tv show here in the U.S. called Dora the Explorer and the main character is a little Latino girl. She and her friends were playing this game. Of course, no mention was made of sacrifices. I do like that altar thing although not what it was used for. I think I’d make a planter out of it.